The versions of Revenge of the Mummy at Universal Studios Hollywood and Universal Studios Florida are more or less the same. They both incorporate dark ride and roller coaster elements to immerse riders in the sinister world of Imhotep and his mummy minions. But there are some subtle and not-so-subtle differences. Mostly, the differences have to do with real estate. The former E.T. and Kongfrontation soundstages, which now house the California and Florida versions of Revenge of the Mummy respectively, occupy different footprints. Orlando’s larger width, depth, and height allow for a larger, longer ride. According to Mike Hightower, Universal’s VP of project management, budget played a factor as well. While he wasn’t specific, the implication was that Florida poured more money into its attraction. Ride Length: One of the major differences is duration. Florida’s Mummy clocks in at about three minutes, while Hollywood shaves 30 seconds off for about two-and-a-half minutes of fun. The Set-Up: In Florida, guests supposedly wander onto the movie set for the next “Mummy” film sequel. The queue, which is quite long, showcases movie props at first and eventually morphs into the Mummy’s tomb. In Hollywood, the line is shorter, and there’s no pretense of a movie set. Guests there enter into the Mummy’s tomb from the get-go. The Launch: In Florida, the vehicles launch at a 45-degree angle up into the mouth of the Mummy, accompanied by some great special effects. In Hollywood, it’s a straight, zero-degree launch. Both versions reach top speeds of 45 mph, however. Going Backwards: In Florida, the vehicles go backward early in the ride after encountering “scarabs,” virtual beetles that appear to infest the tomb and attack the passengers. The backward part of the ride only lasts a few seconds as a transition to the next scene. In Hollywood, passengers don’t encounter the scarabs until halfway through the coaster part of the attraction. They continue the second half of the coaster ride facing backward. The Turnaround: In Florida, the vehicles drop onto a turntable a few seconds after going backward and immediately before they launch into the coaster part of the ride. Projections, lights, sound, and other effects help add to the drama as the vehicles turn. In Hollywood, the vehicles proceed backward for the second half of the coaster ride, and the turntable faces them forwards to the exit area for unloading. The turntable effect is more anticlimactic for the California version. 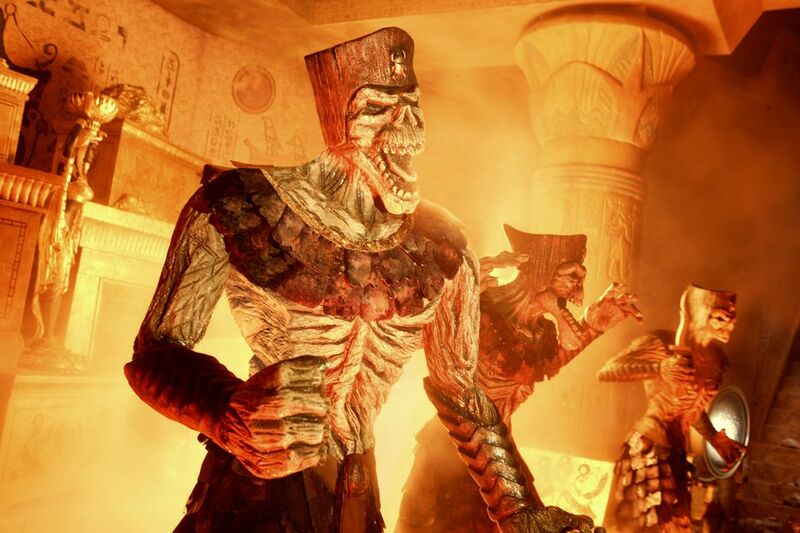 Fire: In Florida, the Mummy unleashes a healthy blast of real fire, and passengers can feel the heat. In Hollywood, the ride uses a “faux” effect to simulate fire. Why Are the Rides Different? Universal Studios Hollywood, with its hilly terrain separated into an upper and lower lot, is especially cramped. It's likely that the amount of space available in Hollywood dictated the shorter, less spectacular Mummy ride. Both rides, however, are great examples of themed, indoor coasters. Could You Score More than Will Smith in Men in Black? I'm a Wimp! Could I Handle Universal's Escape From Gringotts Ride?